Birds in what’s left of the Loop parks have all but vanished, the lake is still frozen, and so I have been walking along the Chicago River lately for my afternoon break. 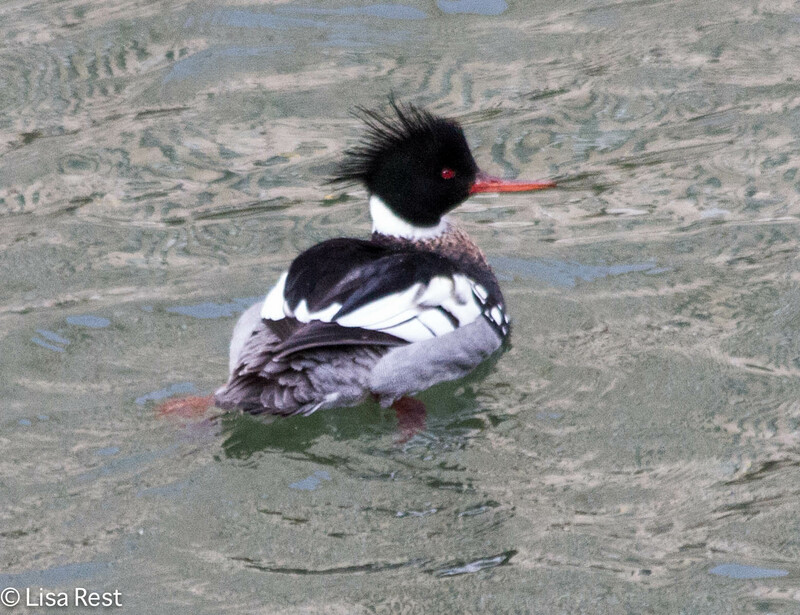 Although there’s nothing really new going on, it’s still amazing to see so many Red-Breasted Mergansers and White-Winged Scoters in the river. 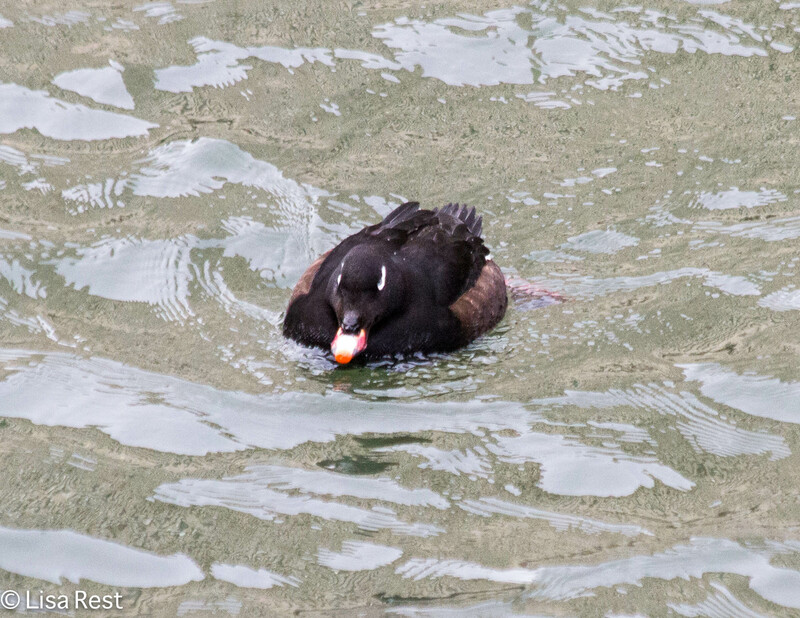 This scoter swam below me for a while and then she dove for something. It’s fairly easy to get to the junction where the branches of the river meet. 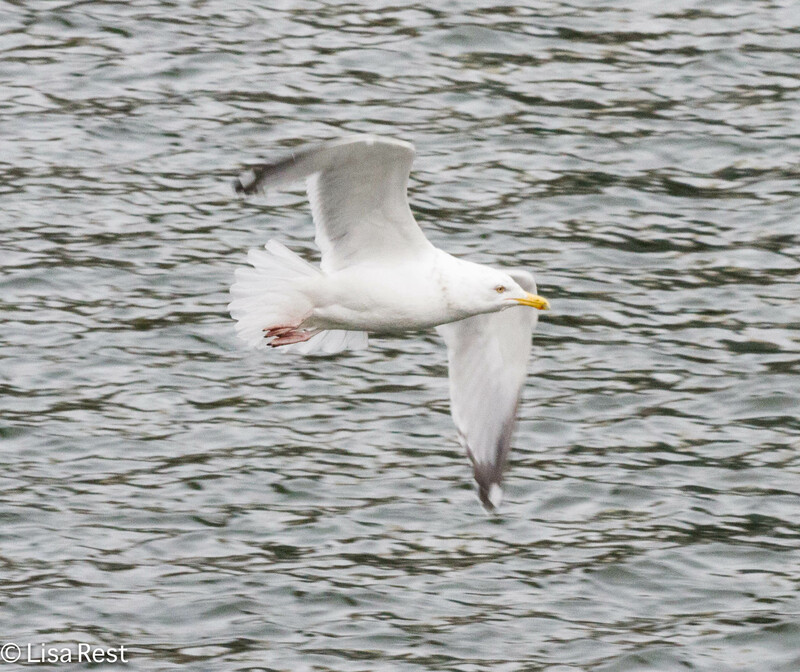 On my last visit there were more Herring Gulls than the usually ubiquitous Ring-Billed. 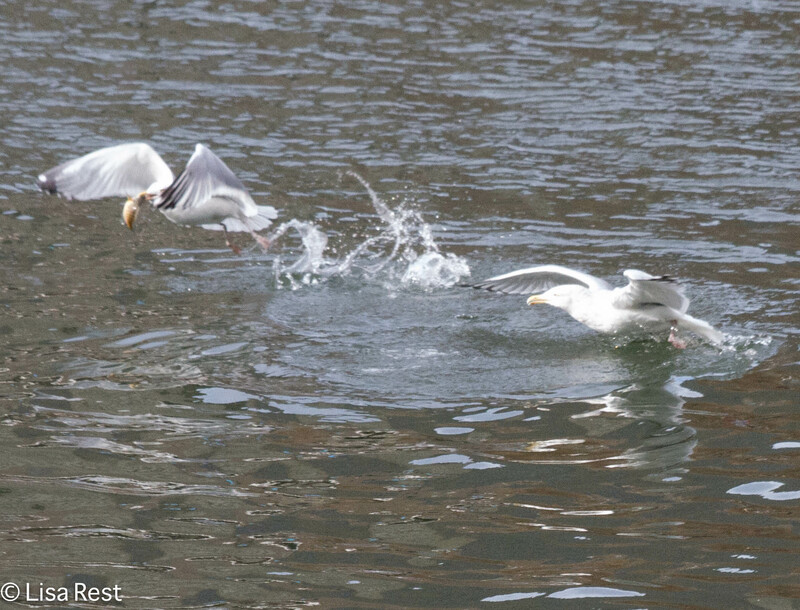 At one point two Herring Gulls got into a match over a fish. 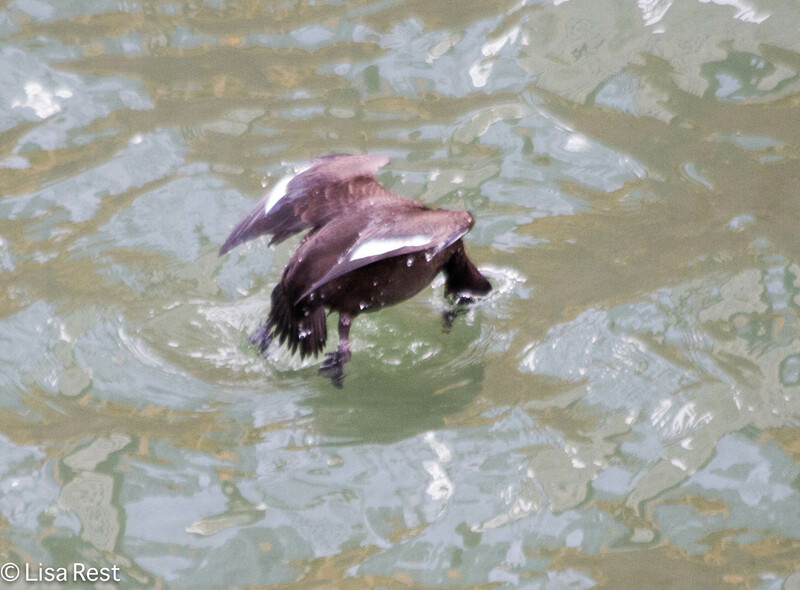 If nothing else this proves there is something to eat even in the Chicago River (and it’s not from the fancy restaurants alongside it). I have seen huge carp, perhaps the invasive Asian species, sometimes surface in the spring, but nothing that spectacular lately. 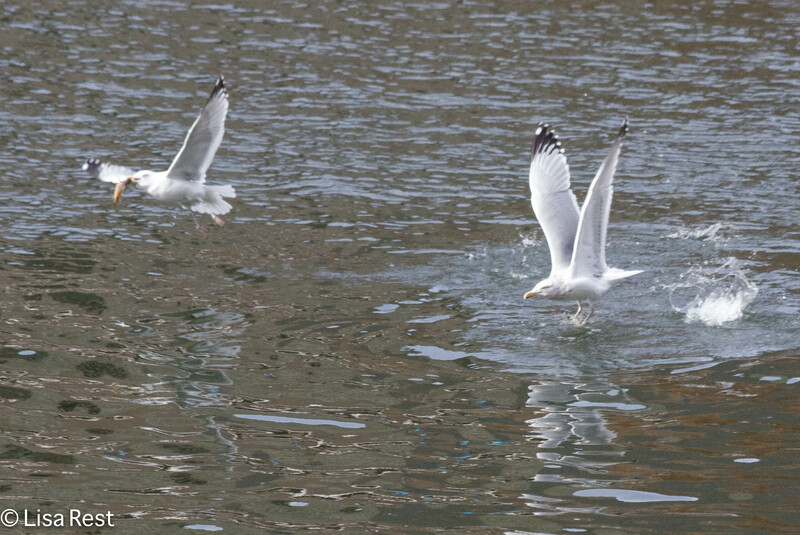 However if you click on the images below you can almost see what the gull on the left has in his beak. 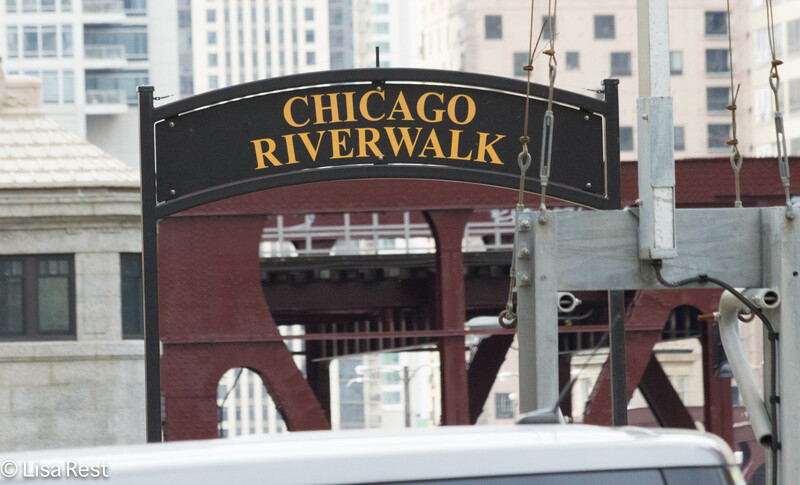 The Riverwalk below street level doesn’t extend along one entire side yet, but there is a sign that looks promising. The stairs leading down to it are blocked off anyway during the inclement weather. Braving the wind, ice on the bridges. 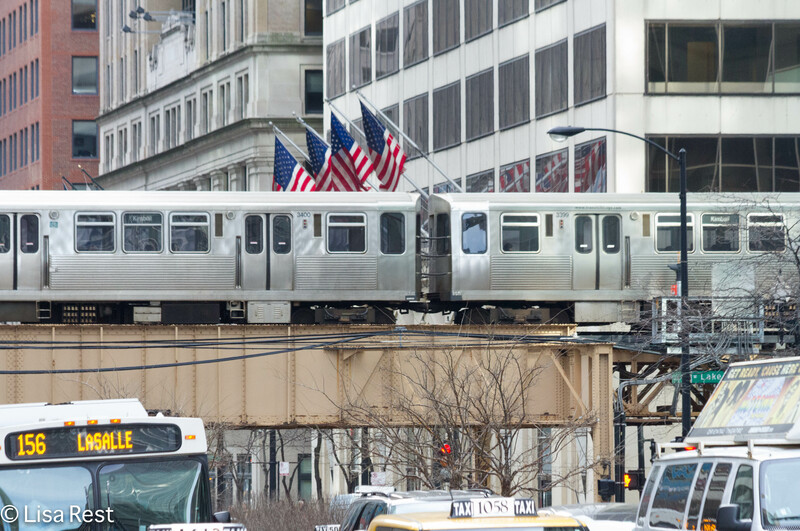 Turning back toward the office, the elevated train “loops” around the city core, giving it its nickname. 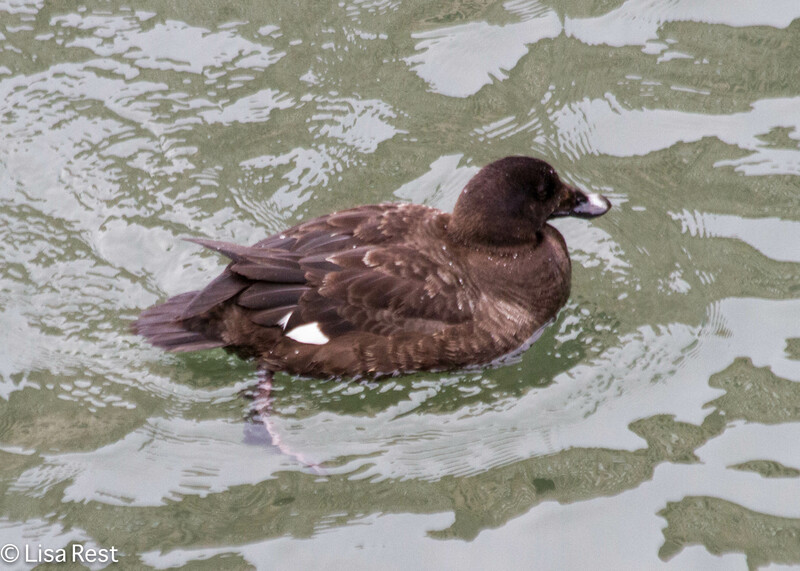 Beyond the Weather, I think I will remember this winter as the one of White-Winged Scoters and Snowy Owls, from seen very well to barely seen at all. Nicer weather and the tourist influx makes Millennium Park challenging for birdwatching on my lunch hour, but it’s closer to where I work so when I don’t have a lot of time, the park beats sitting in the office. Sometimes having lower expectations brings surprises. One thing is certain: my beloved crows are not hanging out there too much. They are shy of most people and even avoid interacting with me in crowded situations. 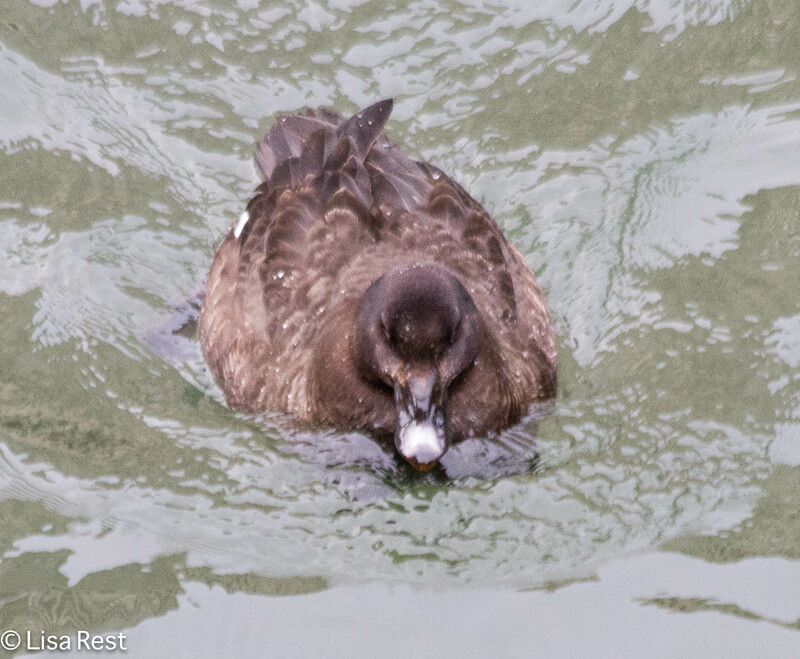 It’s certainly beneath them to beg along with the park’s summer residents that include Common Grackles and Ring-Billed Gulls in addition to Rock Pigeons and House Sparrows. On Thursday I made my way over to the Lurie Garden at the south end of Millennium Park, which is in its first glorious phase of a full bloom cycle. I am particularly fond of Prairie Smoke, which reminds me of cotton candy in its air-blown wispiness. It’s not in the photo above – the plants on the bottom right are Bergamot – but was elsewhere in the garden, and close up below. It’s one of the first flowers to bloom. On the way back I ran into a couple young Grackles,who had just fledged, by the appearance of their pin feathers. 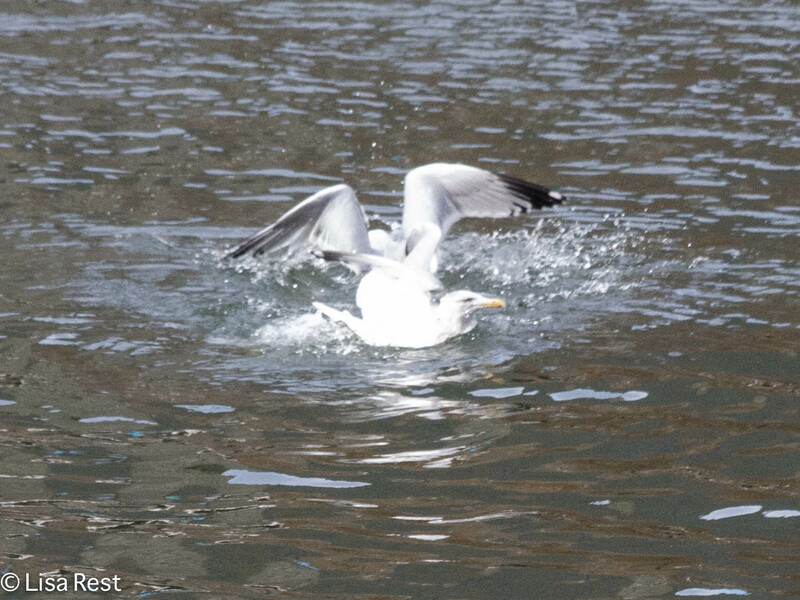 Spring comes to the lakefront in many forms, but none so noisily as the arrival of Ring-Billed Gulls. It’s an opportunity to teach the new crows a life lesson. The juvenile crows thought they had everything figured out and the parks and the lakefront were theirs for the taking, but now these guys have arrived like gangsters. This crow can't believe what's happening. I had even gotten careless with these puny pieces of shelled peanuts: piled up, they were irresistible. The gulls descended upon them in less than a second. It’s my theory that the gulls time their arrival for the festivals and parades, beginning with St. Patrick’s Day this weekend. The highlight of their visit will be the Taste of Chicago in July. A few peanuts won’t be missed, but the crows and I will have to be careful, especially when there’s hot dogs. The crows will learn to be silent instead of calling to each other when they see me, and they’ll stop following me around. 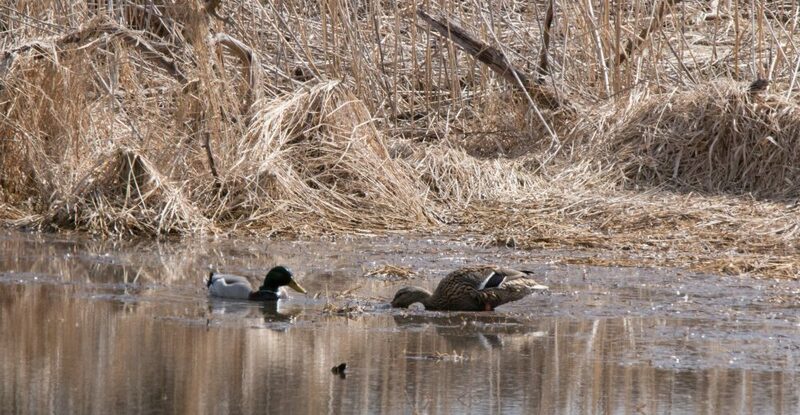 Instead, they’ll meet stealthily at some predetermined location, their choice or mine: it doesn’t matter, we’ll put our heads together. Because if the crows attract any attention to me whatsoever, they’ll lose their monopoly over me. As it is, I hope the gulls have been distracted over the weekend, because they’ll remember me forever if they start associating me with food. And I gave up starting riots a long time ago. What can I say? The Grant Park juvenile crows are glad to have me back in town. 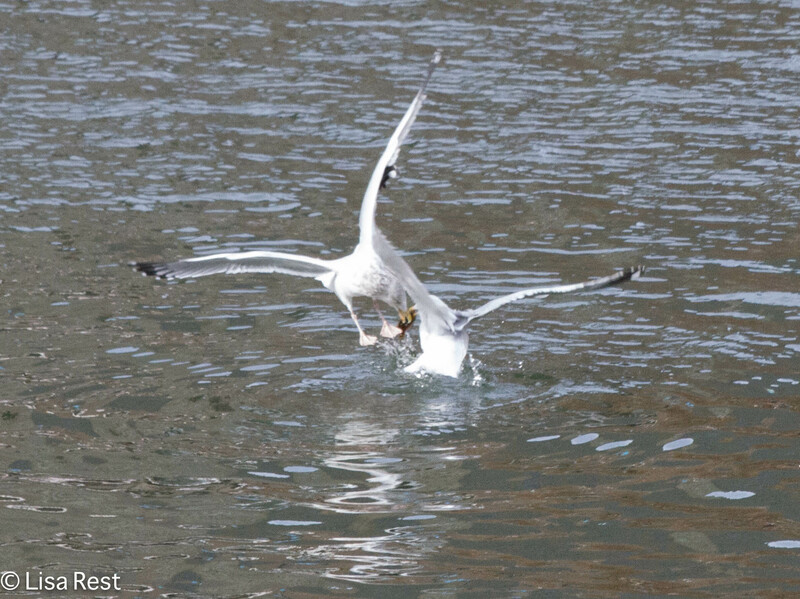 The Ring-Billed Gulls are beginning to assemble and they are the crows’ biggest competitors. I used to feed gulls until the crows got curious enough to reason with me. When I switched to crows it involved a lot of hard thinking to keep the gulls at bay. The crows finally suggested I put hot dogs under the trees, because the gulls prefer wide open spaces. You can see why the crows like me; I’m trainable. 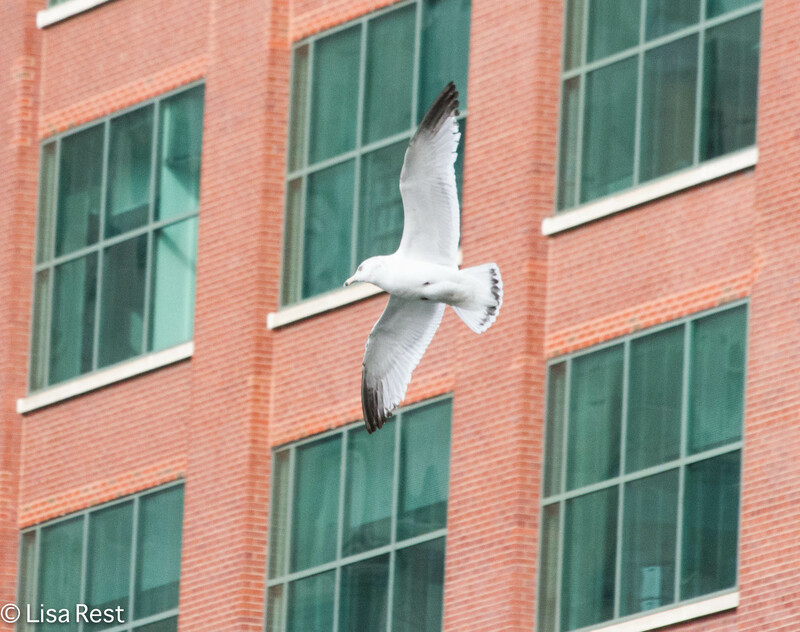 But the gulls are savvy city birds as well and can be seen careening through the glass and steel canyons of the Loop. Some of them aren’t cowed by a few stands of trees in a park, and it only takes one gull to start a riot. It’s going to be an interesting summer for the juves who are still trying to figure out squirrels. This squirrel isn’t reacting at all to White Wing’s threatening stance. Guess she’ll have to cache what she can.